The deceptively small Imagine Mini is sure to make a big sonic impact in your home. By buying this product you'll earn up to 760 Rewards points. The deceptively small Imagine Mini is sure to make a big sonic impact in your home. Expect to hear the kind of realistic sound PSB's larger Imagine series speakers are known for — including an impressively large soundstage and surprisingly low bass — from a speaker that's both versatile and cute. A pair of Imagine Minis makes an impressive desktop system. 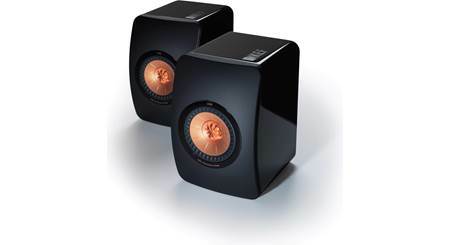 Or use them with any of the other speakers in the Imagine family to create a multichannel home theater system. Plus, their compact, seamlessly curved cabinets make them ideal for stylish urban environments where space is at a premium. The Imagine Mini comes in five beautiful finishes: Black Ash, High-gloss White, High-gloss Black, Dark Cherry, and Walnut. Each Imagine Mini features a highly accurate 1" titanium dome tweeter that produces smooth, sparkling highs. 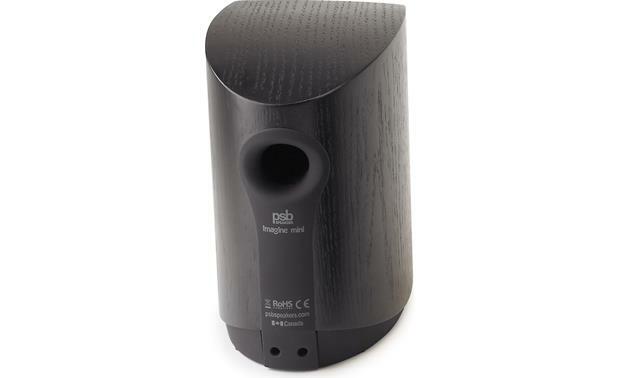 The 4-1/2" woofer uses a proprietary ceramic-filled polypropylene cone, which makes it very stiff and light. The resulting midrange is clean and balanced, with tight bass response. 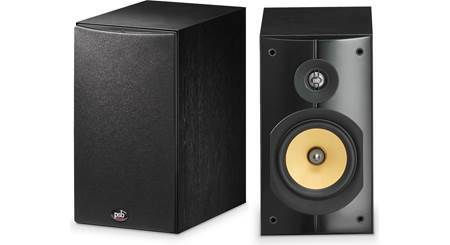 A highly efficient motor structure drives the woofer, and uses a unique compound magnet that helps to reduce any audible distortion from the speaker. It means you'll hear every note as clearly and accurately as it was recorded by the artist. All Imagine speakers have smooth, 1-1/2"-thick front baffles that blend almost seamlessly with the seven-layer laminated MDF side, top, and bottom panels. Plus, the heavy internal bracing ensures an impressively solid, acoustically inert enclosure. The top, side, and bottom panels of the Black Ash, Dark Cherry, and Walnut speakers are clad in a real wood veneer that's hand selected for its beauty and quality. The High-gloss Black and High-gloss White speakers are finished with multiple coats of high-gloss paint, hand-polished to a stunning shine. 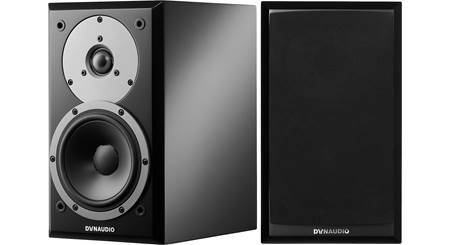 These speakers are simply amazing, i am a PSB customer for life. Optical from my computer to a cxa60 amp along with a powered sub. This is the sweetest sounding desktop setup i have ever heard. If you are looking for a killer desktop setup, this will not disappoint. True-to-Nature Sound: The PSB Imagine mini bookshelf loudspeaker produces a large soundstage and impressive bass along with the true-to-nature sound for which PSB is known. The PSB Imagine mini has a wide frequency and dynamic range, natural tonal balance, and precise spatial imaging needed to make both music and movies lifelike and enjoyable. 2-Way Design: The PSB Imagine mini employs a 2-way speaker design. It houses a single 1" ferrofluid-cooled titanium dome tweeter with a neodymium magnet and one 4.5" clay/ceramic filled polypropylene woofer with rubber surround. The result is startlingly big and commanding sound with fine detail and emotion. 1" Titanium Dome Tweeter: The 1" titanium dome, ferrofluid-cooled tweeters use a neodymium magnet structure to help extend the frequency response at both ends for effortless, airy top octaves and smooth, uncolored response. 4.5" Clay/Ceramic Filled Polypropylene Woofer: The 4.5" woofer cone is clay/ceramic filled polypropylene to optimize the combination of stiffness, internal damping, and low mass. The woofer's magnetically neutral polycarbonate basket contributes additional stiffness, and the bullet-shaped phase-plug enhances linearity at higher frequencies. Crossover Network: PSB engineers designed the crossover frequency very low relative to the woofer size in order to provide the same sound no matter where the speaker is placed. The crossover is a 2-way acoustical fourth order Linkwitz-Riley type with a 24 dB/octave slope. The tweeter and woofer are crossed over at 2,200 Hz. Small Cabinet: The PSB Imagine mini bookshelf loudspeaker is the smallest member of the imagine family. The cabinet measures just 5.6875" (w) x 9.375" (h) x 8.25" (d), and weighs only 6.5 lbs. Bass Reflex Enclosure: The PSB Imagine mini bookshelf loudspeaker uses a bass reflex enclosure with a rear-firing port for higher efficiency and deeper bass. Detachable Grille: The PSB Imagine mini includes a detachable cloth/metal grille. Binding Posts: The binding post input terminals are located on the bottom of the speaker cabinet. The binding posts will accept spade connectors, pin connectors, and bare wire up to 8 gauge. Single banana plugs also fit, but because the posts are on the bottom of the speaker, the banana plug extends below the bottom surface and the speaker can't sit flat on a shelf. Single banana plugs may work with some wall brackets and stands. Rubber Base: The PSB Imagine mini features an integrated rubber base to help secure the speaker in place to prevent slippage and vibration. 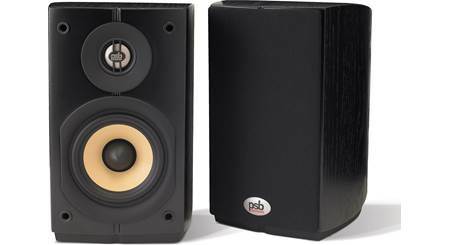 Optional Speaker Stands: The PSB PFS-27 speaker stand (760PFS27, sold separately) is designed specifically for the Imagine mini bookshelf loudspeaker. 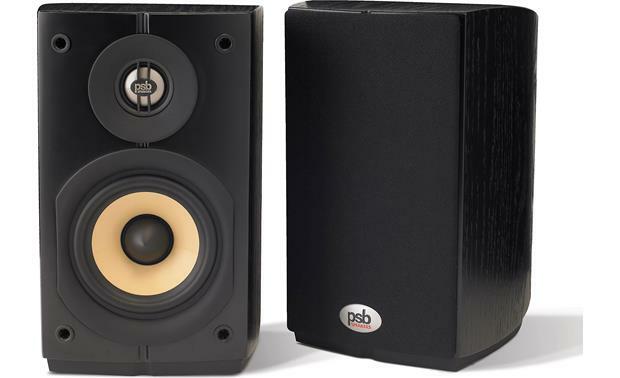 Optional Wall-Mount Brackets: There are two M6 threaded inserts on the bottom of each speaker that can be used with PSB's PWB-1 wall-mount bracket (760PWB1, sold separately). 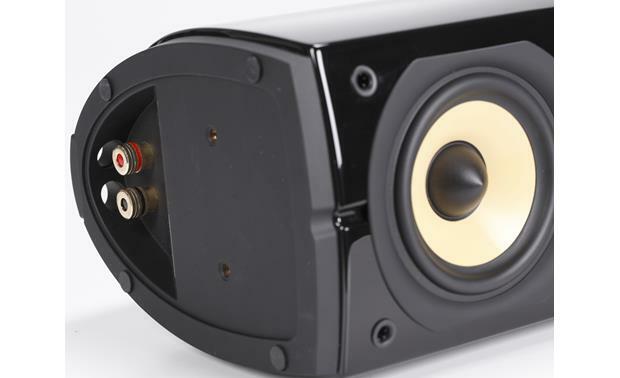 Note: The speakers contain no integrated mounting brackets or keyhole slots. Searches related to the PSB Imagine Mini Compact bookshelf speakers.